KXStitch, the cross stitch app for Linux, just got an update a few hours ago with enhancements, bug fixes, and translation updates. 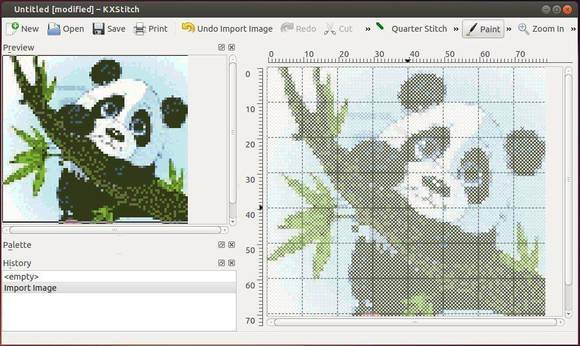 KXStitch is a KDE/Qt based software that lets you create cross stitch patterns and charts. Patterns can be created from scratch on a user defined size of grid, which can be enlarged or reduced in size as your pattern progresses. Alternatively you can import images from many graphics formats which will allow you to reduce the number of colours and to restrict the conversion to full stitches or optionally use fractional stitches. You may also use an image as a background. These imported images can then be modified using the supplied tools to produce your final design. Besides building this app from the source tarball, you can install the KDE build from the PPA repository. So far, the PPA supports Ubuntu 14.04, Ubuntu 13.10, Ubuntu 12.10, Ubuntu 12.04 and their derivatives.